CLOSE THE GAP BETWEEN YOUR PRODUCTION EQUIPMENT AND YOUR PRODUCTION IT. Boost your IT connectivity to Industry 4.0 and beyond. When you are responsible for shop floor IT integration and you need to integrate a high variety of production equipment, periphery and devices with other IT systems or with the Cloud, then our SMARTUNIFIER is what you require. Starting with the integration of single equipment and IT systems, SMARTUNIFIER is scalable to integrate whole facilities with several thousands of communication partners. 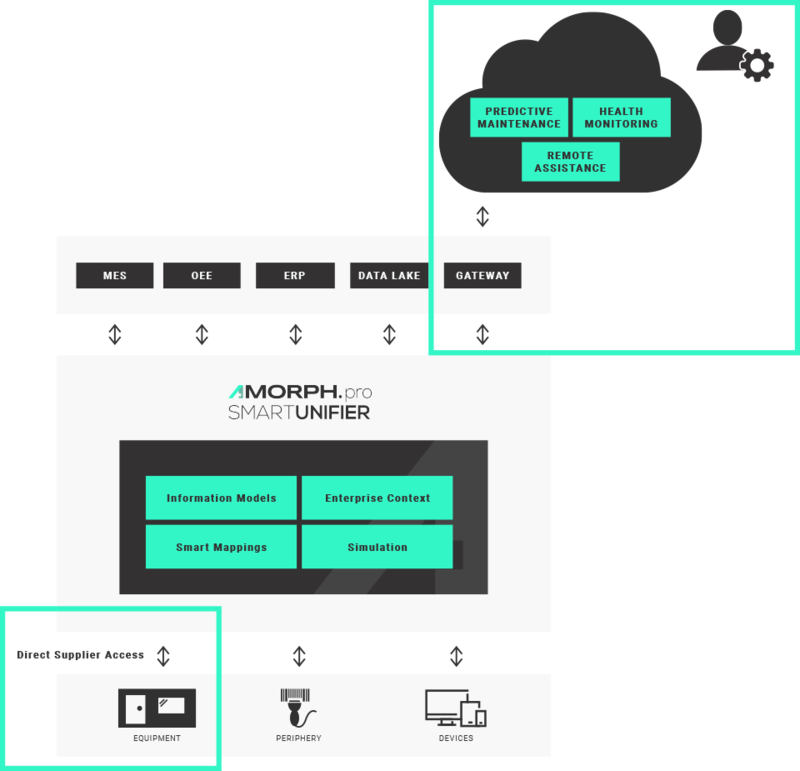 Moreover, SMARTUNIFIER opens a unique way to migrate step by step to modern communication standards like OPC-UA and to apply enterprise-wide semantics to data. 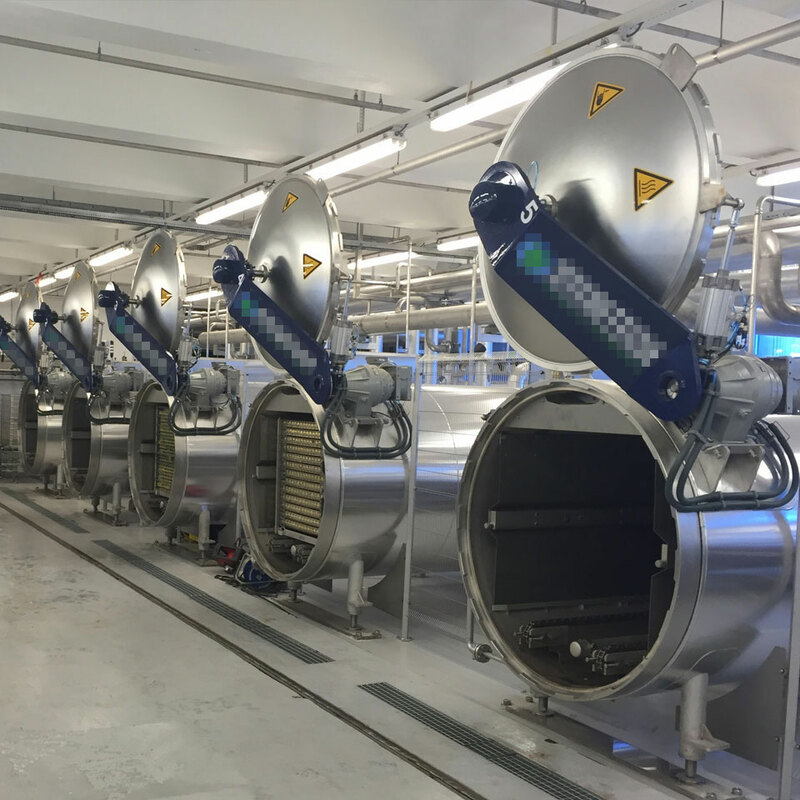 When you are supplying equipment for production facilities that need to be integrated fast, flexibly and easily to your customers’ production IT environment, you can install SMARTUNIFIER directly into your equipment. Moreover, you bring your customers into the driver seat for performing the equipment integration and interface configurations by themselves. 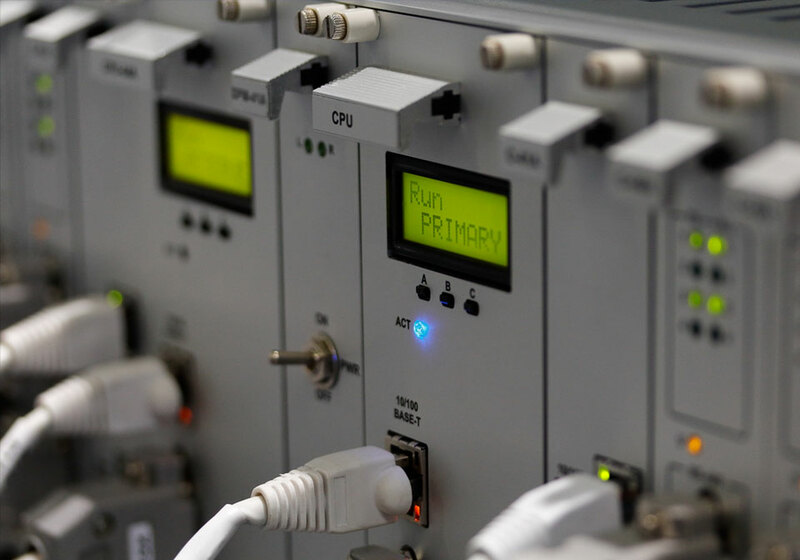 This way you get powerful out-of-the box IT connectivity for your equipment without having the need to develop complex IT interfaces on your own. Easy, fast and flexible bi-directional interconnection of multiple IT systems and equipment within a production facility. Reuse interface configurations multiple times with minimum effort. Fast adaptation of legacy communication protocols and formats to modern enterprise standards. Easily implement complete fab communication sequences that cover multiple steps. Establish new services and business models by giving secured multi-channel access to equipment and device data in real-time. Migrate step by step to modern communication standards and apply enterprise-wide semantics to data. Rely on unlimited scalability from single equipment and devices to whole facilities. Out-of-the-box connections between equipment, devices and other IT systems to Cloud infrastructures. Deploy your communication capabilities wherever it is required for your production IT environment : on a server environment: on an equipment PC, or directly on the SMARTUNIFIERBOX – or all combined. 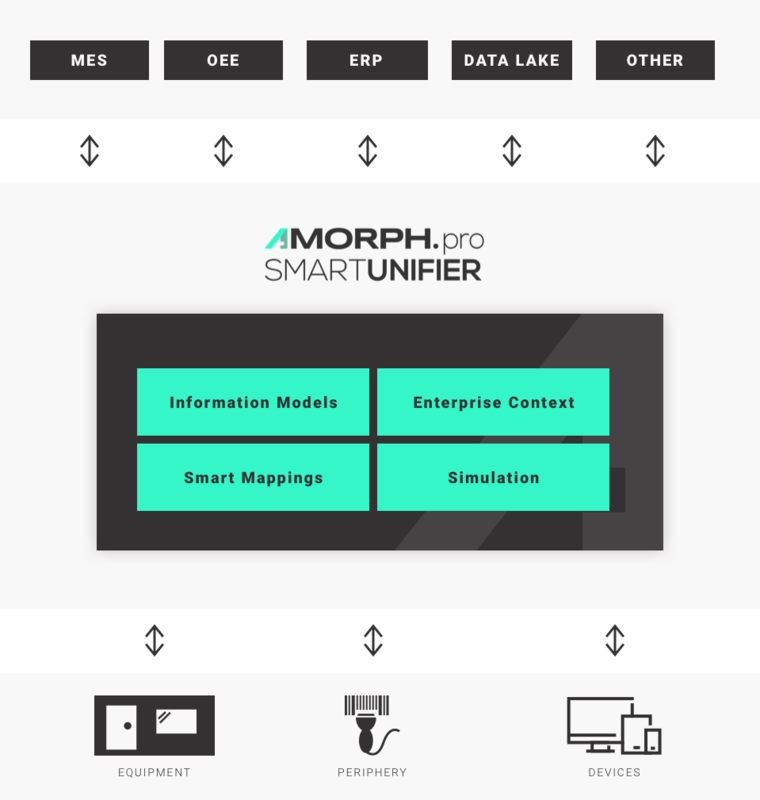 As an equipment vendor you might also operate SMARTUNIFIER as an OEM product, i.e. integrate SMARTUNIFIER invisible into your equipment. Simply connect the SMARTUNIFIER with the equipment control software and provide a very powerful out-of-the box IT connectivity for your equipment. And without the need to develop complex IT interfaces on your own. Depending on the power of the executing device and the interface requirements, multiple SMARTUNIFIERS can run in parallel on one single hardware device. Currently up to 250 SMARTUNIFIER instances can run on one Server device and up to 10 instances run on one SMARTUNIFIERBOX. Getting your SMARTUNIFIER is simple. Buying your own SMARTUNIFIER or SMARTUNIFIERBOX is really simple. We support you in all required steps to plan and successfully execute your specific Industry 4.0 Use Case. Just contact our sales representative and get started. Then we will arrange a personally moderated demo session and show you the power and easiness of the SMARTUNIFIER Platform. Depending on your specific requirements we will create a tailored offer for your Industry 4.0 use case. With pleasure, afterwards we will support you in all steps for installation, configuration and taking the SMARTUNIFIER into successful operation. We will facilitate all the necessary means so that you can easily adapt SMARTUNIFIER‘s configuration on your own and react flexibly to changes of communication data and formats. If in addition you would require specific software adaptations or even specifically tailored software developments we will love to provide you high-quality support therefore. You want your Production IT moving to Industry 4.0? Join AMORPH.pro and grow your business. Easy, fast and flexible bi-directional interconnection of multiple IT systems and equipment. 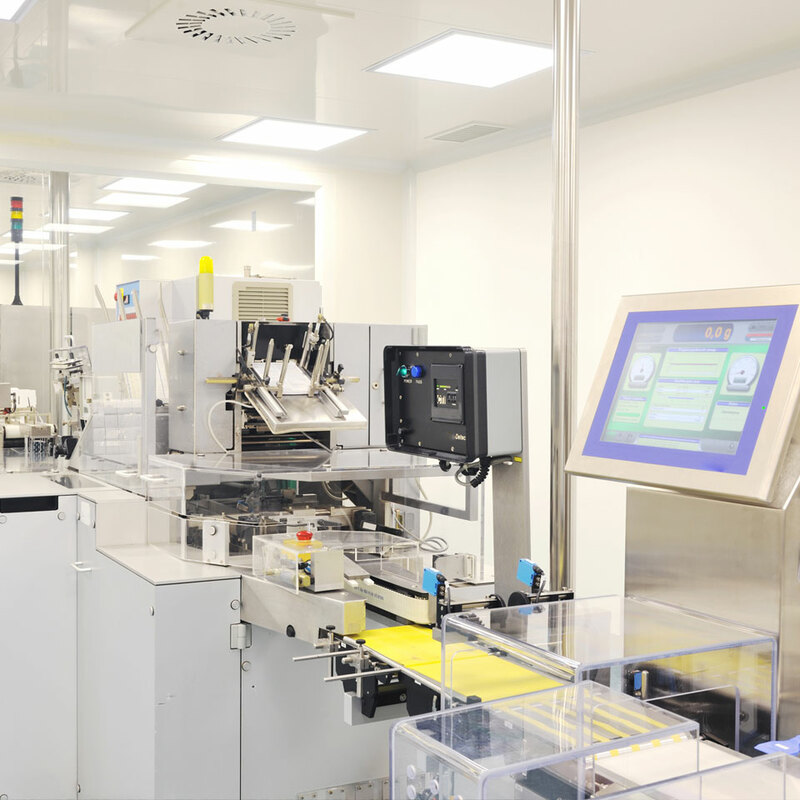 Interconnecting heterogeneous shop floor equipment and devices with IT systems and interconnecting different IT systems with each other is a central requirement for a successful transition to modern Industry 4.0 IT landscapes. 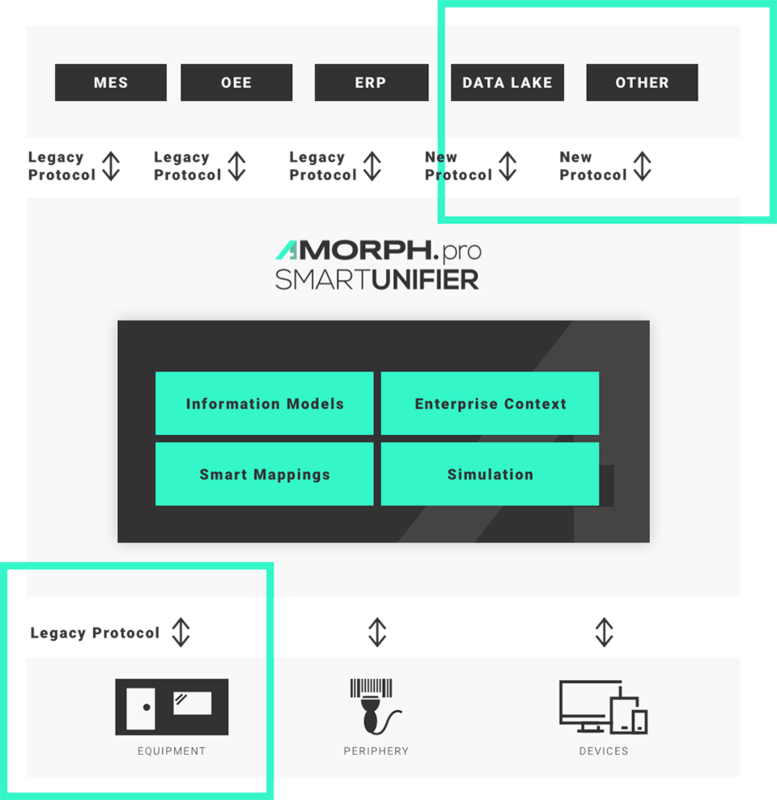 Results from renowned reference customers have shown, that average equipment integration efforts and cost can be reduced by up to 90% using the SMARTUNIFIER and its advanced technologies to perform powerful IT integration by configuration instead of tedious interface programming. Reuse information models and mappings with minimum effort for all communication interfaces. 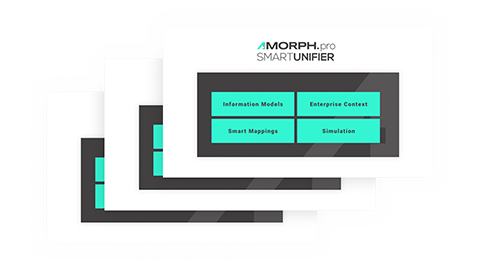 When running an IT network with a higher number of installed SMARTUNIFIER instances, all previously created interface configurations (Information Models and Smart Mappings) can be reused easily and shared across the whole installation. This way similar equipment types are integrated using the same connection and translation logic. Changes and updates of interface configurations can be deployed from a centrally accessible Master Repository, eliminating the need to touch and update each equipment or device individually. Summarized, SMARTUNIFIER allows a highly comfortable and effective management of very small to very large IT communication environments, creating minimum overhead and letting you reach your main goal: Excellent Manufacturing with a full Industry 4.0 IT infrastructure. 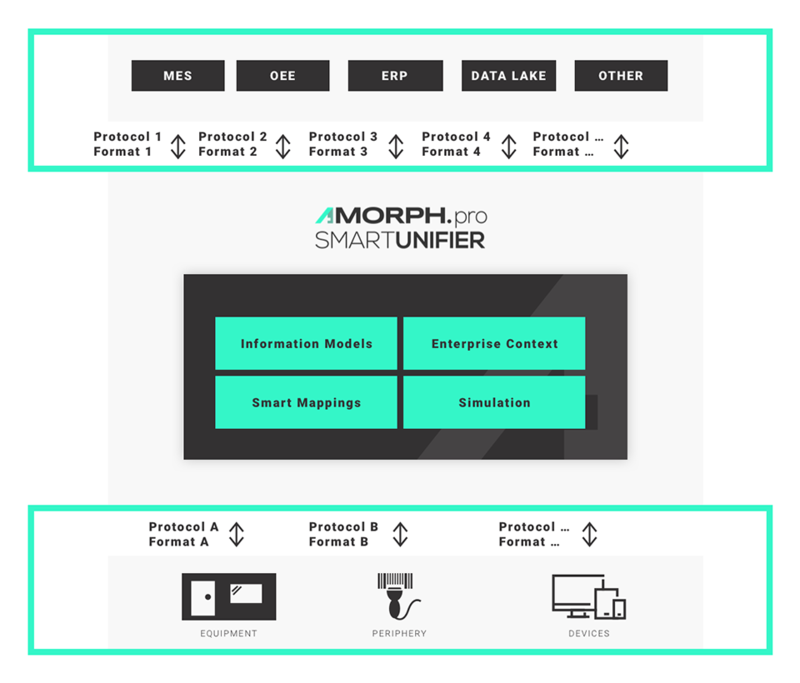 By applying SMARTUNIFIER‘s configurable protocol translation (Smart Mappings) modern communication standards like e.g. 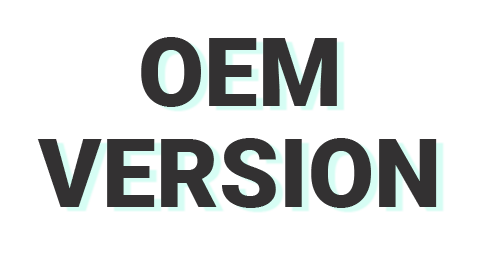 OPC-UA or XML over message bus are fully supported. 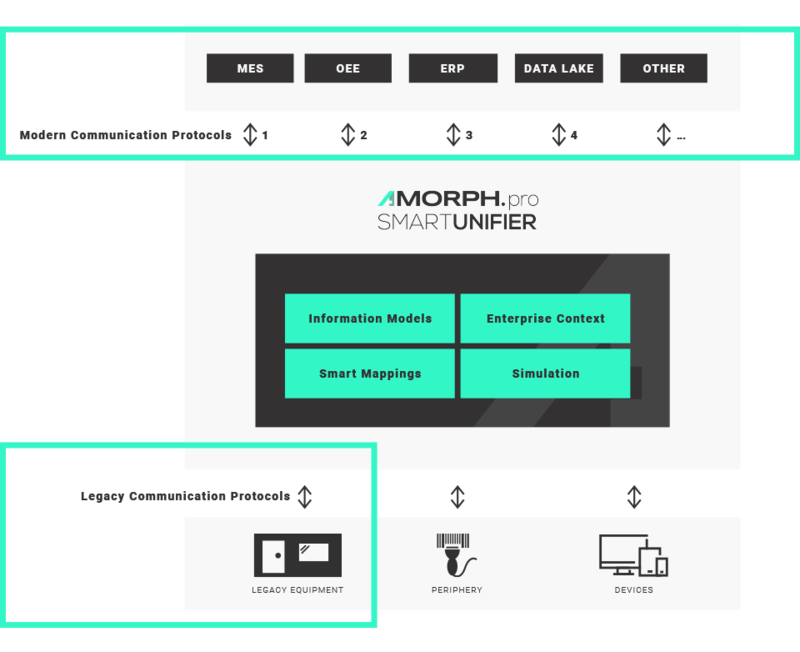 SmartUnifier first time allows a really smooth migration from existing communication protocols and formats (e.g. between existing equipment and MES) to new Industry 4.0 standards. This unique capability of SMARTUNIFIER is realized by simply using existing communication channels simultaneously with newly introduced channels. When finishing the migration, the old channels can be switched off without any risk. With SMARTUNIFIER it is not only possible to give access to simple equipment or device data and to provide „some data to MES and Cloud“. 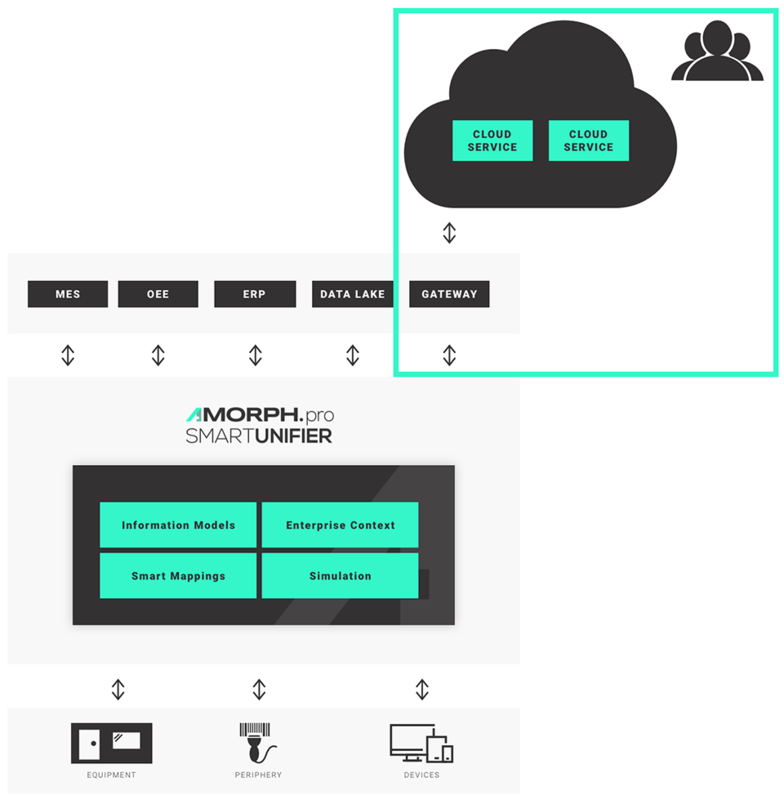 Moreover, with SMARTUNIFIER complete communication scenarios between equipment to upper level IT systems can be easily implemented. These can cover all steps from identification, validation, order start as well as sending results and process data from equipment to MES or Cloud. Of course it is also possible to provide any parameter data (recipes) from MES or SCADA to equipment. 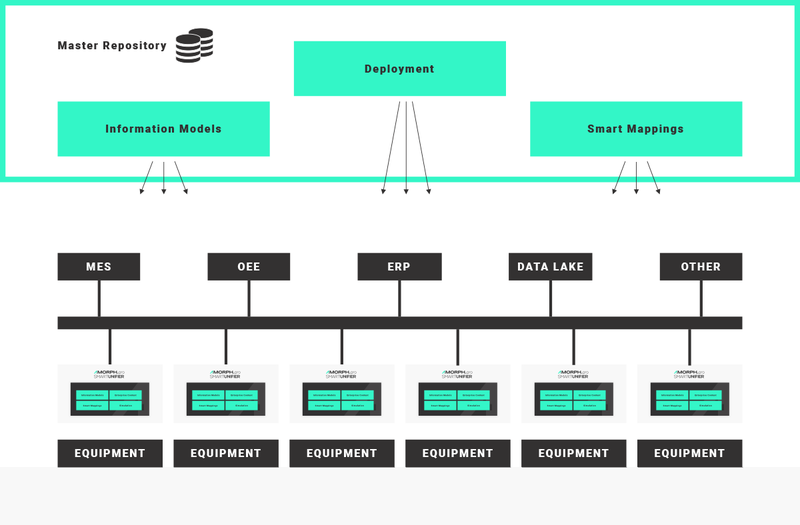 Production equipment can be integrated with SMARTUNIFIER to provide direct access for equipment suppliers or maintenance service providers to relevant equipment data (e.g. equipment status, equipment key parameters etc.) via an Equipment Supplier Cloud. 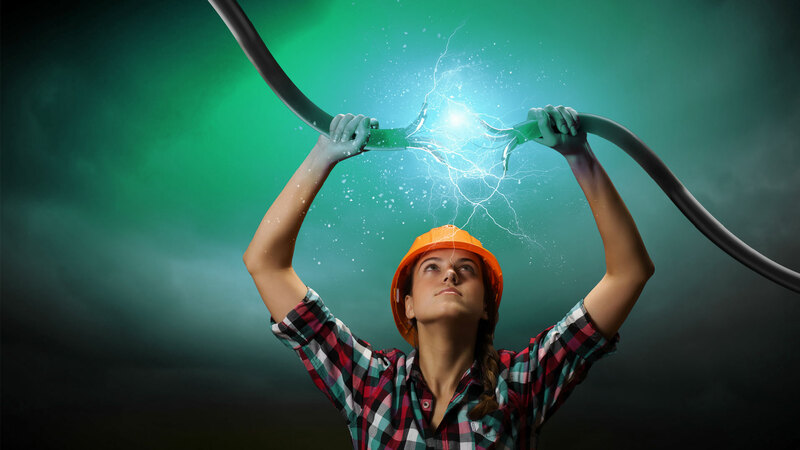 This way new innovative business models for equipment suppliers are supported by building the base for "Production as a Service" offerings and remote predictive maintenance. Also, further advanced business use cases with SMARTUNIFIER are possible, e.g. 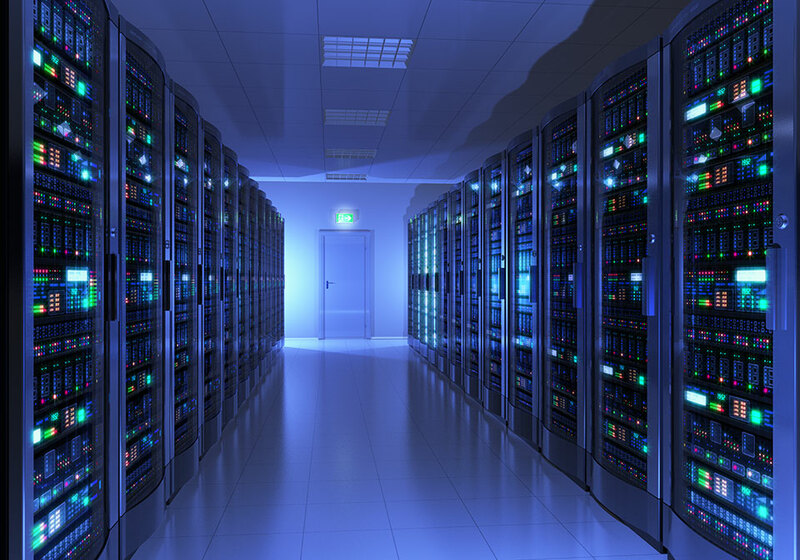 by implementing real-time equipment monitoring capabilities in a cloud environment. 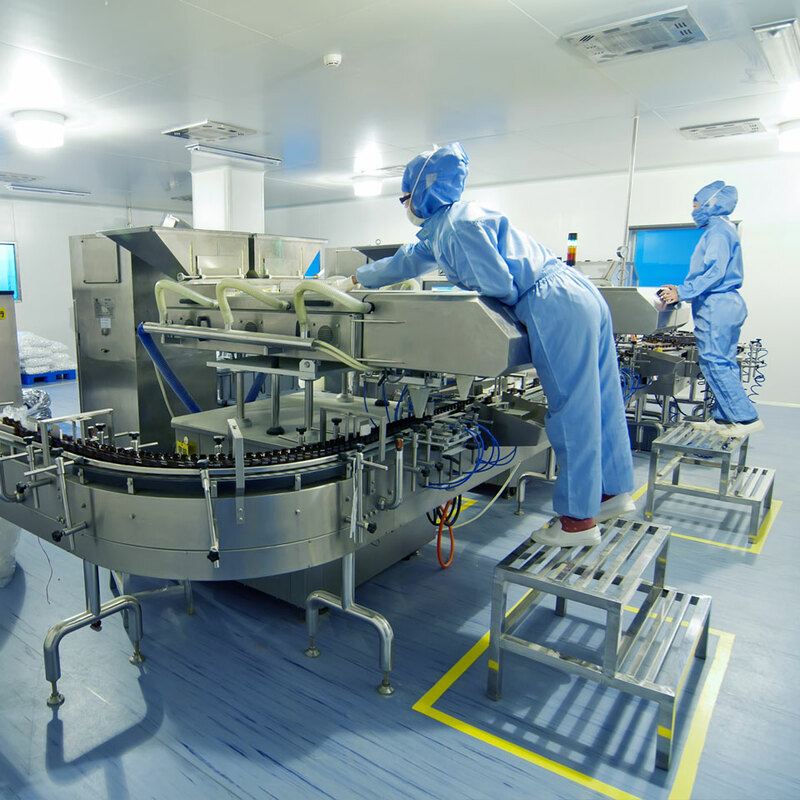 Another SMARTUNIFIER use case is to give Remote Assistance by equipment suppliers for achieving production optimization and to ensure the most efficient usage of equipment resources by customers. Migrate step by step to modern comunication standards and apply enterprise-wide semantics to data. A key feature of SMARTUNIFIER is to open an easy way to integrate new IT systems using modern communication protocols. This is realized by simply adding additional communication channels to the existing legacy channels. A unique feature of SMARTUNIFIER in this respect is, that all existing IT systems with their legacy protocols and formats can still be operated in parallel with the newly established IT systems (e.g. Data Lake, Advanced Analytics, Cloud, etc.). This way, it is for the first time possible to step by step introduce modern communication standards and incrementally migrate to a state-of-the-art Industry 4.0 IT architecture, but still keep the existing IT infrastructure fully operable. SMARTUNIFIER is the first integration platform, allowing nearly unlimited scalability in terms of number of connected equipment and devices. 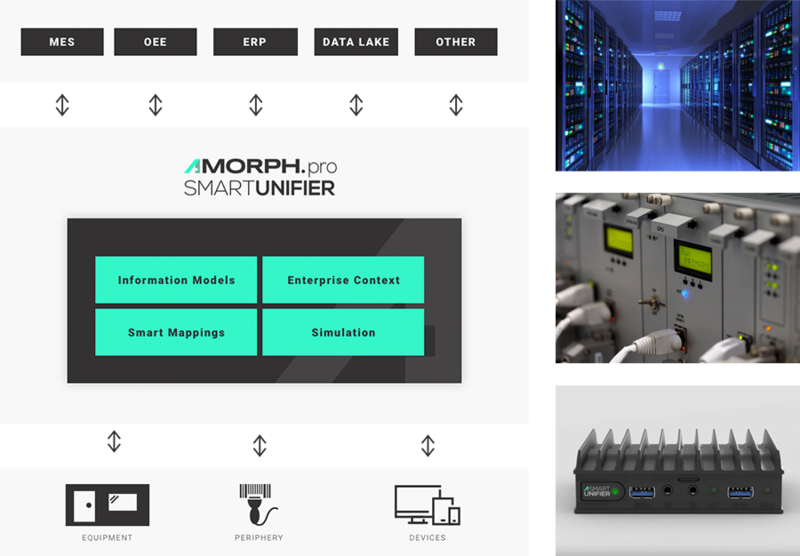 SMARTUNIFIER platform can be applied for integrating one single equipment or device. But with SMARTUNIFIER also hundreds or even thousands of equipment and devices within whole facilities can be integrated to upper-level systems or into the Cloud. Or even both! This is because SMARTUNIFIER is not a traditional middleware having a central limiting message bus. Nor SMARTUNIFIER contains any central performance and latency limiting database for providing its communication features. 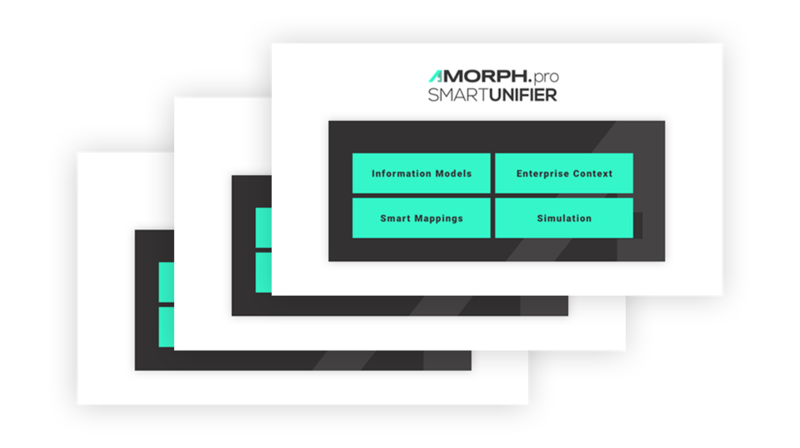 SMARTUNIFIER moreover works as a clustered environment. Using advanced technologies of distributed computing is the key for enormous scalability. In a large installation a high number of SMARTUNIFIER instances, each with extreme low software footprint, provide the required communication capabilities. These single instances can be deployed to any location within an enterprise IT network – on a server or on an equipment PC. Or even on the tiny SMARTUNIFIERBOX, which is easily pluggable into any equipment or manufacturing cell. central operations monitoring of installed SMARTUNIFIER instances. Thus, SMARTUNIFIER is an absolutely essential piece of Industry 4.0 for any manufacturing enterprise – allowing fab-wide and enterprise-wide management of production communication and IT integration infrastructure. 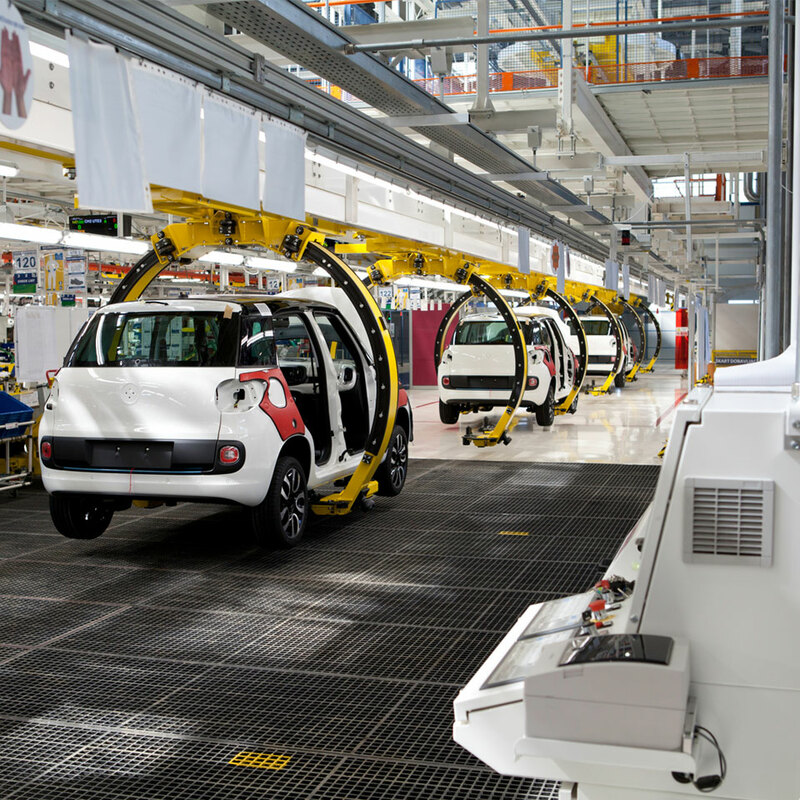 With SMARTUNIFIER the IT connectivity requirements of manufacturing and logistics environments are fully met. The connected world of digital services becomes reality. By acting as a translator between equipment and any IOT devices precise and secured access of data consumers is possible, easy connection to any Cloud based infrastructure is also possible (e.g. AWS, Azure, etc.). The hardware and housing of the SMARTUNIFIERBOX are designed together from the ground-up to minimize size and maximize capabilities, durability and thermal performance. 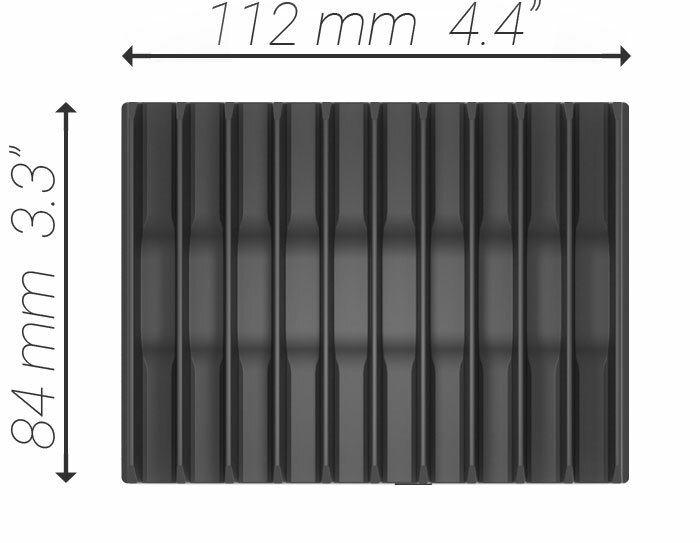 The SMARTUNIFIERBOX measures only 112 mm by 84 mm. It is one of the smallest full-featured connectivity devices on the market. The fanless cooling hardware is based on quad-core Apollo-Lake Atom with up to 16 GB RAM. It provides performance that not long ago required a Core CPU that could not be fitted in such a small passively-cooled footprint due to higher power consumption. SMARTUNIFIERBOX provides dual Gbit Ethernet ports (Intel I211) that can be extended to 4 ports. The SMARTUNIFIERBOX is able to operate at the full industrial temperature range of -40°C to 85°C. 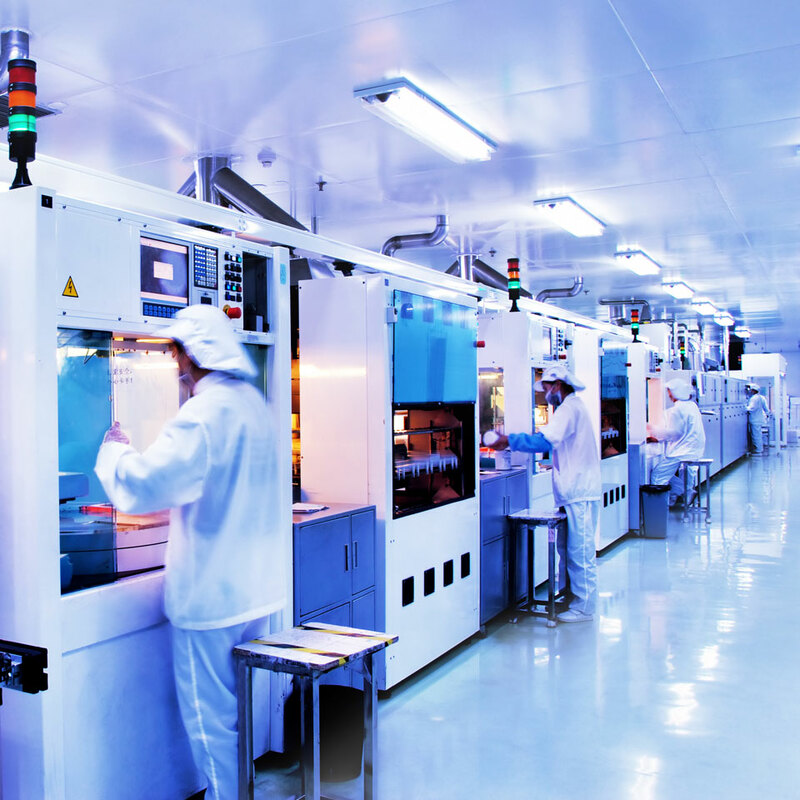 With no fans that suffer significantly lower MTBF at extreme temperatures and an embedded CPU rated for 125°C, the reliability of the SMARTUNIFIERBOX is not affected by the extreme temperatures. 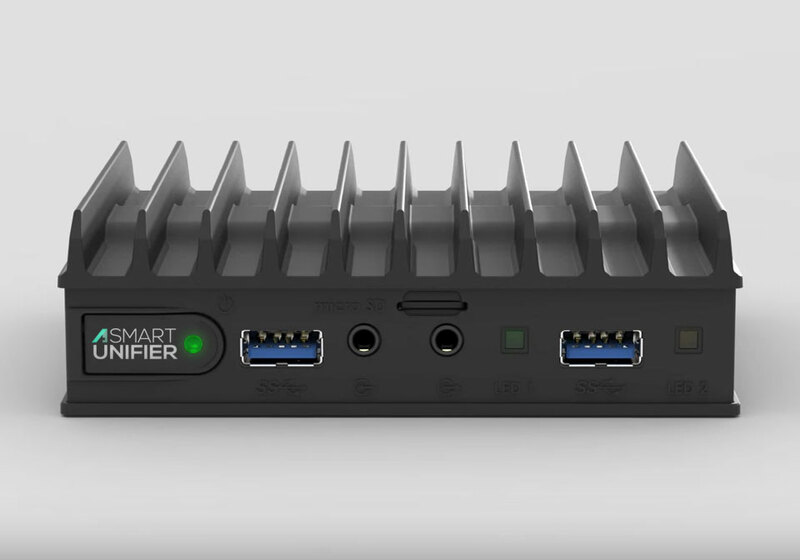 The embedded grade fanless design practically eliminates aging, which allows us to provide unconditional 5-year warranty on the SMARTUNIFIERBOX hardware. The SMARTUNIFIERBOX device is small enough to be easily and securely mounted in nearly any IoT scenario – in a cabinet, in an equipment or just mounted behind a display, on the wall or on a furniture. SMARTUNIFIERBOX supports various mounting options including VESA and DIN-rail mounting. Typically, you will purchase one SMARTUNIFIER runtime software license per production equipment to be integrated. This includes an unlimited number of communication channels to periphery and upper level IT systems. With one SMARTUNIFIER you are able to connect one equipment incl. Periphery devices to as many upper level systems (e.g. MES, SCADA, ERP) as you require. The license price for SMARTUNIFIER is a combination of a one-off price and afterward a yearly recurring subscription fee for receiving e-support and continuous updates. The one-off license price includes the first year of e-support and updates. Depending on the number of purchased licenses, attractive price discounts are available. SMARTUNIFIERBOX TEN: with 10 SMARTUNIFIER instances preinstalled. With SMARTUNIFIERBOX no separate installation process required – just connect the SMARTUNIFIER to your equipment and gain immediate powerful Industry 4.0 connectivity „out of the box“.